When people talk of local sourcing and sustainable farming, the discussion usually centers on modern methods. What about the indigenous produce of Arizona? Foods, such as prickly pear, have been found in the wild and utilized for their abundance for more than 1,000 years before conventional agriculture became an important industry in the state. Native American tribes of the Southwest established traditional dry farming techniques, growing corn in an arid setting with minimal water. Native cuisine focuses on foods yielded from what, at first glance, often seems an unforgiving landscape. Beans, corn and squash are considered the “three sisters” and used in numerous flavorful dishes. The list also includes cholla buds; mesquite pods, which can be milled into flour; chiltepin peppers to fire up salsa, and more. The high desert landscape boasts a nutritious and distinct terrain that can’t be replicated. 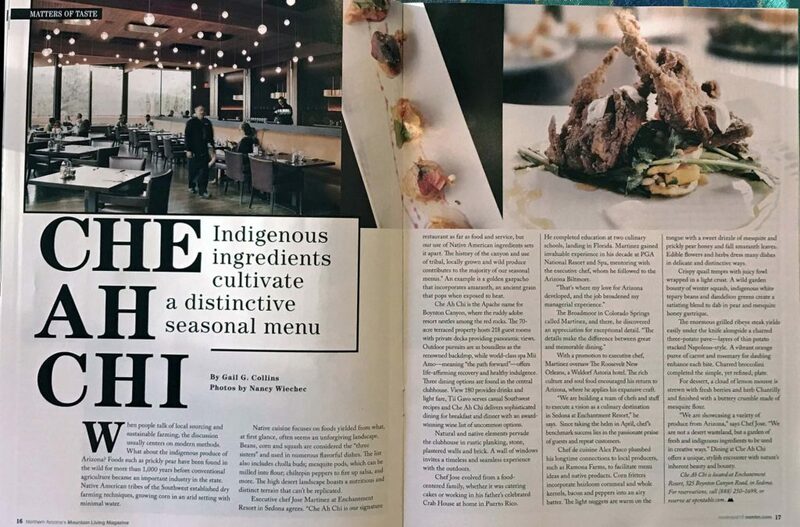 Executive chef Jose Martinez at Enchantment Resort in Sedona agreed, “Che Ah Chi is our signature restaurant as far as food and service, but our use of Native American ingredients sets it apart. The history of the canyon and use of tribal, locally grown and wild produce contributes to the majority of our seasonal menus.” An example is the golden gazpacho, which incorporates amaranth, an ancient grain that pops when exposed to heat. Che Ah Chi is the Apache name for Boynton Canyon, where the ruddy, adobe resort nestles among the red rocks. The 70-acre terraced property hosts 218 guest rooms with private decks providing panoramic views. Outdoor pursuits are as boundless as the renowned backdrop, while world class spa Mii Amo—meaning “the path forward”—offers life affirming recovery and healthy indulgence. Three dining options are located in the central clubhouse. View 180offers drinks and light fare, Tii Gavo serves casual Southwest recipes, and Che Ah Chi delivers sophisticated dining for breakfast and dinner with an award-wining wine list of uncommon options. Natural and native elements pervade the clubhouse in rustic planking, stone, plastered walls and brick. A wall of windows invites a timeless and seamless experience with the outdoors. Chef Jose evolved from a food-centered family, whether it was catering cakes or working in his father’s celebrated Crab House, in his native Puerto Rico. He completed education at two culinary schools, landing in Florida. Martinez gained invaluable experience in his decade at PGA National Resort and Spa, mentoring the executive chef, whom he followed to the Arizona Biltmore.